Dharamshala: Members of club 1880 who are motivated by a wish to change the world, consisting of eighty-five people from Singapore, including Singaporeans, Americans, Australians, Britishers, Indians, Canadians, Chinese, French, and Swiss had an audience with His Holiness the Dalai Lama at his official residence in Mcleod Ganj yesterday. The group members are from different backgrounds and of different faiths united by the motivation to change the world and make it a better place to live. His Holiness greeted them all as he walked into the room, but paid special attention to the little boy in the front. During the meeting, His Holiness suggested if people belonging to the 21st century made an effort to change things through education, then one might see a more peaceful and more compassionate world after one generation or so. 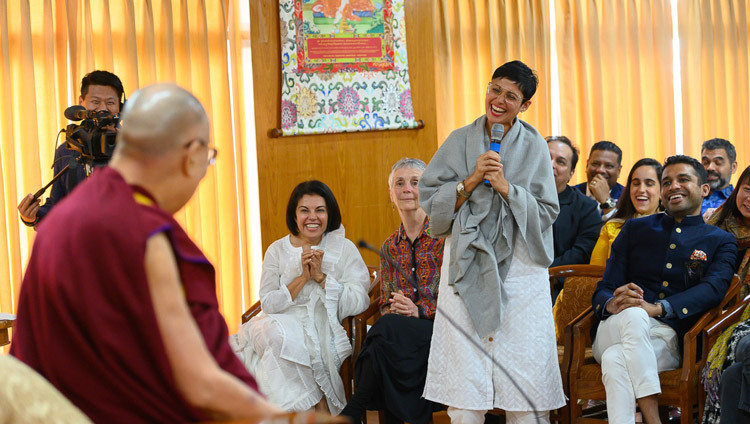 His Holiness shared his experience of how he has been learning to tackle emotions and how difficult life has been at some point of time yet through all the experiences he learned that being able to keep the peace of mind helped him. He remarked that it is the nature of the samsara to be full of problems, but in such problems, it’s always better if one can keep the peace of mind. And to maintain the peace of mind one has to cultivate the awakening mind of Bodhichitta, to have concern for other beings and to remember their kindness. He expressed how he wishes to have a joyful life and how others wish the same. And for that one needs to generate the warm-heartedness towards each other in daily life. Since we all have the Buddha nature within us and if we consider others as a being like self, then it would be easy to feel close with any people we come across. His Holiness also highlighted the benefits from the cultivation of warm-heartedness and compassion and the need to tackle our disturbing emotions to maintain the peace of mind. The importance of emotional hygiene was also emphasised by stating that as we learn to look after our physical health, we have to learn to look after our minds too. If you are physically fit and your mind is distressed, you’ll be unhappy. His Holiness further remarked on the welfare of all the 7 billion human beings and how we are dependent in this world for our survival and our own happiness. Challenges such as climate change have to be faced by all of us together so consideration for the welfare of all the social being becomes important. His Holiness touched upon his major commitments, viz. Promoting Compassion as a true source of happiness since nobody wants problems and although we live at peace here there are people going through all kinds of trouble including violence in the name of religion. His Holiness advised much better than that is to live in peace with one’s neighbour. His Holiness foregrounded on his second commitment, Encouraging religious harmony as all religious traditions despite their philosophical point of views, conveys the message of love. And India upholding the tradition of ahimsa or non-violence motivated by compassion is a major witness of religious harmony in action. 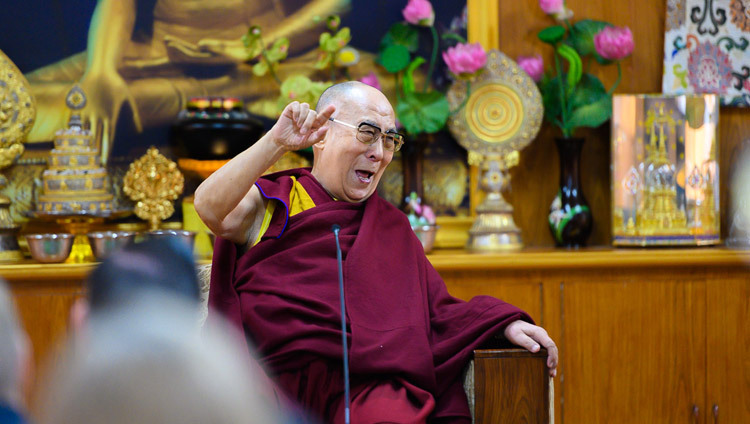 His Holiness further mentioned about the relevance of the Nalanda Tradition in present time, and how it is preserved and sustained among Tibetans. Since Shantarakshita encouraged the translation of Sanskrit Buddhist literature into Tibetan, the language was so enriched that it is now the best medium suitable for accurately expressing Buddhist philosophy. Furthermore, His Holiness expressed his admiration for the spirit of the European Union which places common interest above narrower national concerns. He spoke of the past when Tibet was independent and with the change in time, he said that since 1974, after raising the issue of Tibet at UN for several times, decided not to push any longer for independence. And what we seek are the rights for Tibetan Autonomous Regions mentioned in the Chinese constitution, including the right to preserve our culture and language. 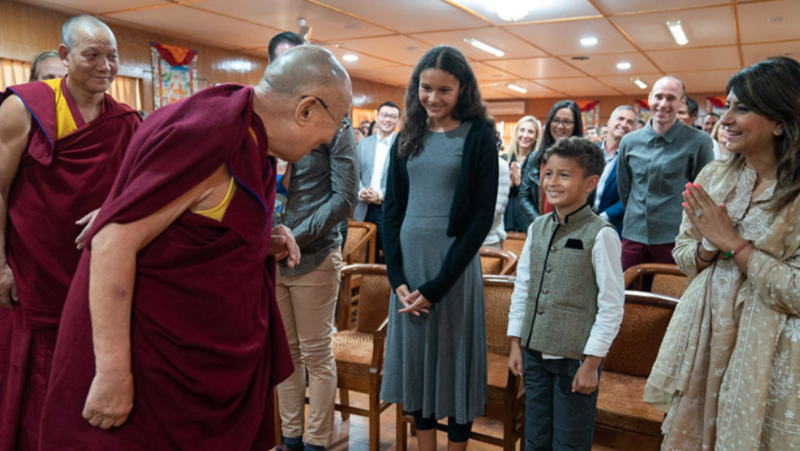 His Holiness suggested that modern education would be better if more attention is given to inner values, encouraging children to cultivate and enhance their natural sense of warm-heartedness.